Children in LAUSD Schools? Yes, two graduates and a sixth-grader. Campaign funding: As of Feb. 23, LA City Ethics Commission filings show that Posey has neither raised nor spent any campaign funds. Q. What experiences will you bring to the school board? A. I believe I bring a unique perspective to the board, that of a parent who has worked with students, teachers, and administrators to enhance outcomes on campuses throughout the district. Q. What are the most important issues facing schools in your district? A. Low expectations, lack of interest, lack of safety, and lack of support have led to poor outcomes and low graduation rates. Q. Why did you decide to run? A. Parents, students, and teachers desperately need an advocate, someone who is protecting their interest, their success, and their needs. One who is not beholden to invested interest that will take the focus off providing quality education to every child on every campus. Q. How are you getting your message out? A. Grassroots campaign, word of mouth, meeting people where they are, churches, and community events. 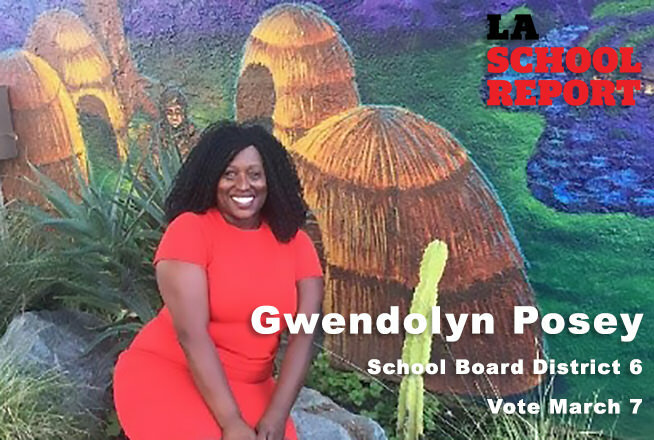 The advantage to the LAUSD Board District 6 seat is that my efforts will impact, benefit, give hope and a voice to the entire district and not just the schools that I have had the privilege to work with.